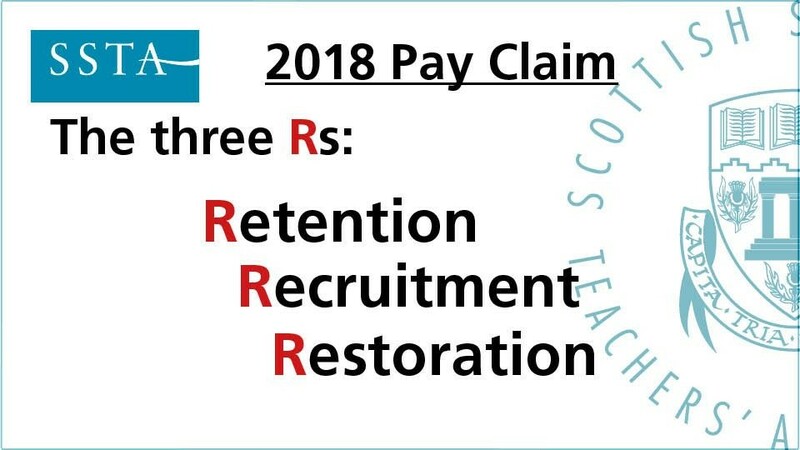 The SSTA Salaries and Conditions of Service Committee met on 14 January to consider developments in the 2018 Pay Negotiations. The Committee firmly rejected the COSLA offer (3% in April 2018 plus a further 2% in August). This offer also included a 3% increase in April 2019 and a 3% increase in April 2020. The Committee appreciated that this offer removed the divisive intent in previous offers but did not meet the aspirations of members. Should this be the only offer on the table from COSLA the Committee recommended that SSTA move to a statutory ballot for industrial action. At the moment the DFM’s letter is not an offer. Only COSLA, as our employers, can legally make an offer and COSLA has said it cannot consider making an offer until its Leaders meeting planned for 25 January. The Committee is concerned that COSLA has been a major stumbling block throughout the negotiations if it were keen to resolve this dispute they should be able to table a new offer quickly. The Committee agreed should a new offer be forthcoming SSTA would conduct a Consultative Ballot of members. In preparation for the next stage of the SSTA Campaign the Committee has agreed to conduct an opinion survey of members on the proposal contained within the Deputy First Minister’s letter. This opinion survey is to be conducted through SSTA School Representatives. The Committee is recommending that school representatives hold a meeting of members in schools to discuss the proposal and report the views of members back to SSTA Head Office. The opinion survey will be sent to the school representatives on Wednesday 16 January. School Representatives will receive an e-mail invitation for the survey on Wednesday morning. If you do not receive this invitation please contact the SSTA Office.